Having missed most of last week’s sunny spell, (due to the considerable inconvenience of having to work for a living!) we headed out on Sunday to Hartlebury Common. 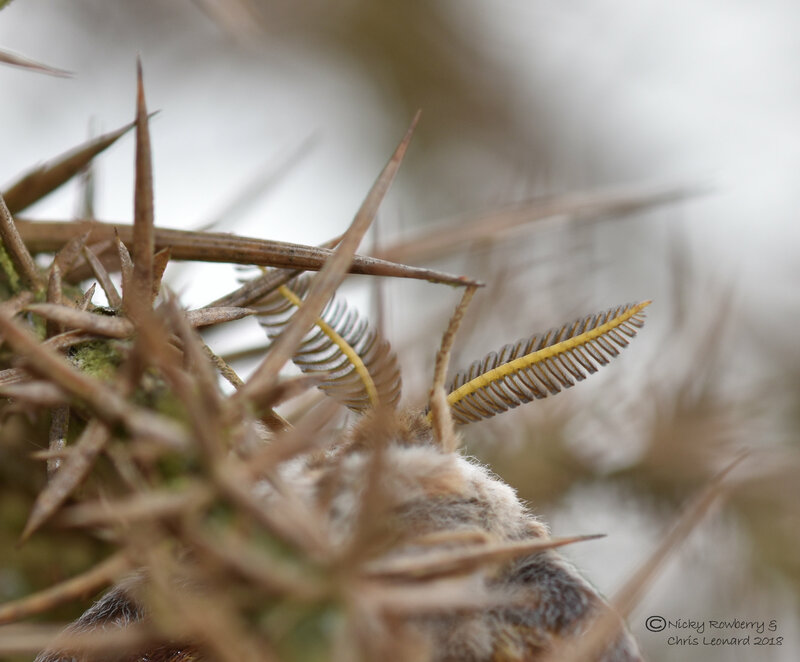 Almost exactly 2 years ago we’d gone to Hartlebury in search of the Emperor Moth – with zero success that time. But this time we had a secret weapon – a pheromone lure! 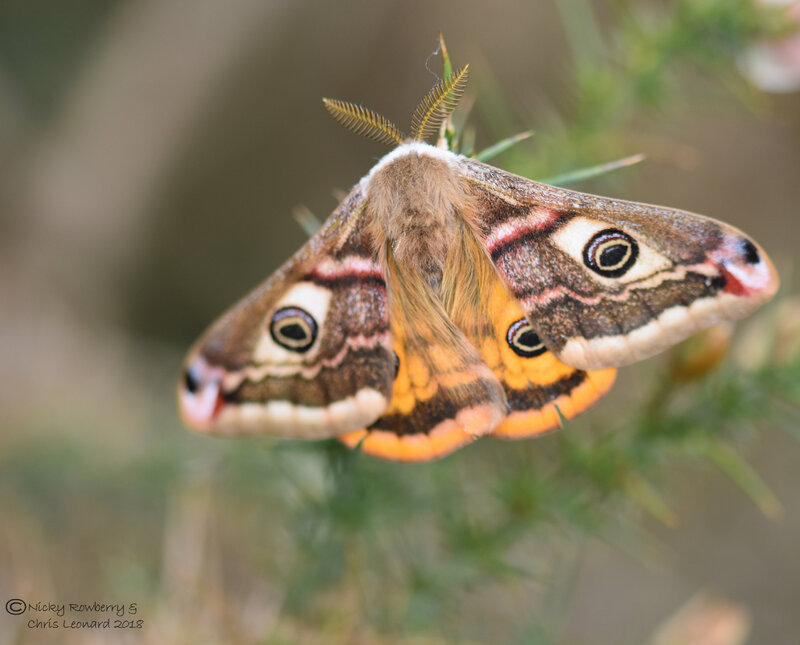 Male emperor moths fly during the day looking for females. The females fly at night, but during the day they sit in the undergrowth wafting irresistible pheromones out to the males. The males pick up the scent with their feathered antennae and home in on the object of their desire. You can now buy pheromone lures that will fool the poor males into thinking you are a desirable female. This does feel a bit like cheating and a bit mean to deceive the males this way. But since it was probably the only way we were going to see this beautiful moth, I’m afraid we went for it – although making sure we didn’t leave the pheromone lure out for too long to disrupt their normal behaviour. So we wandered about for a bit before selecting what seemed a suitable spot to put the lure down. We’d barely got set up when the first male came hurtling over the gorse. It shot over the lure and landed on a gorse bush nearby, where he then stayed. They are big moths, so you’d think they’d be easy to spot, but it was surprisingly difficult even when we knew roughly where he’d landed. When we did find him, he was hanging on a twig with his underside towards us – so here’s one of our first photos. 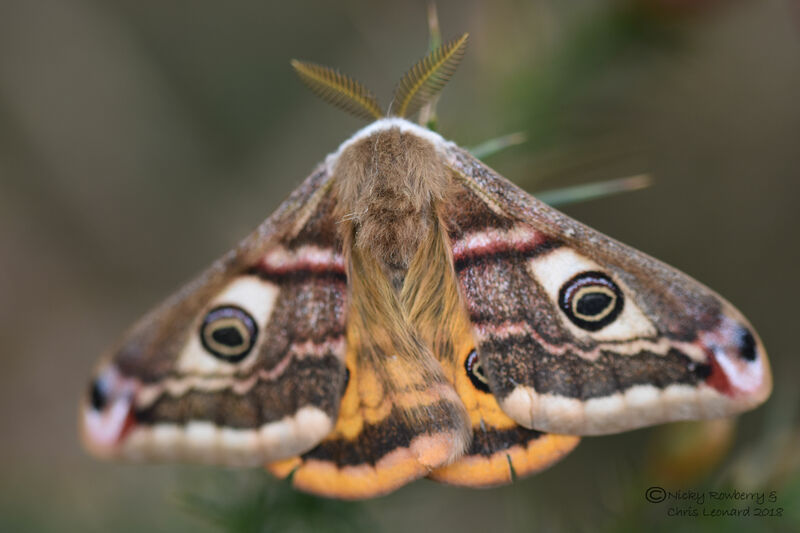 They are really quite furry/hairy moths with very impressive big eye spots on the wings. The males’ antennae are very large and feathery to pick up the female pheromones. Not easy to focus on, but here’s my best effort. Almost immediately a second male came bombing in towards the lure. This one however refused to settle. It seemed (not surprisingly) confused by the lure and flew around excitedly looking for a female. This blurry image is him circling the lure. While he hovered around the lure looking for the female, I hovered around him trying to get a decent photo. As he didn’t settle, the best I managed of him was this flying shot. 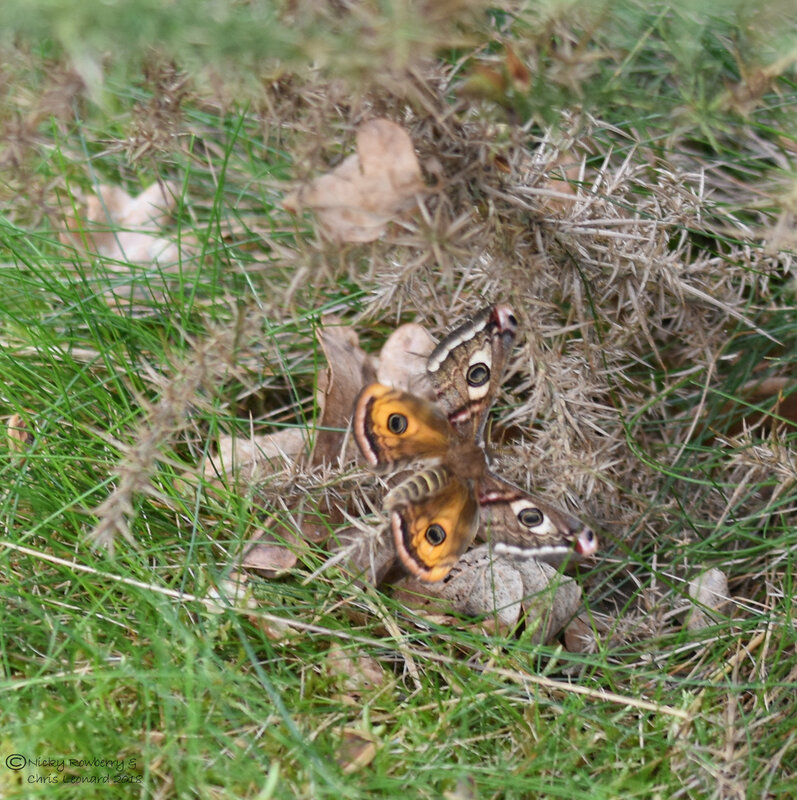 Not great, but at least you can see the lovely yellow underwings and all four peacock-like eyespots. This second male eventually gave up and disappeared back into the gorse. The original male though eventually shifted position, so that we could now see his other side. 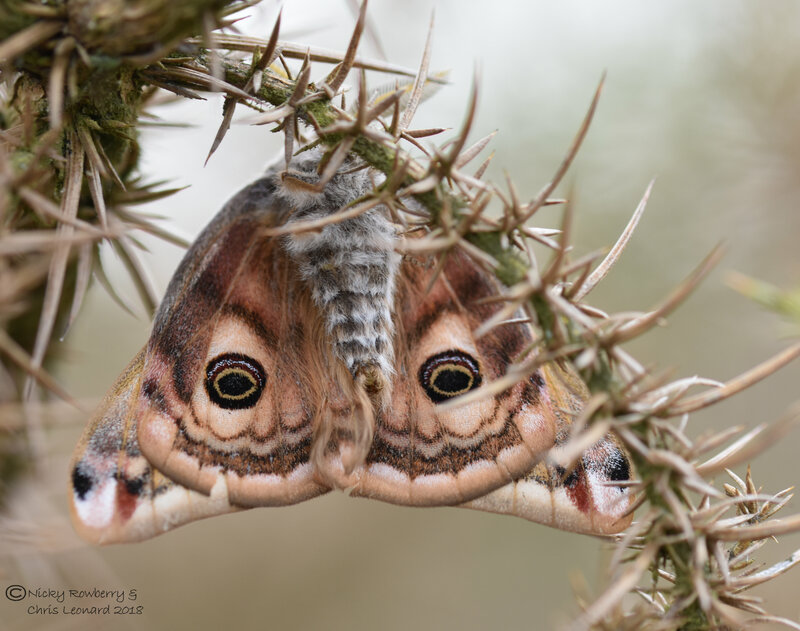 So we finally got the classic Emperor moth shots we were looking for. Having got the photos we wanted, we packed up to leave the males in peace to pursue genuine females. The moths weren’t the only animals with love on their minds though – these bloody-nosed beetles were clearly feeling spring in the air. Hartlebury Common is very busy with birds. 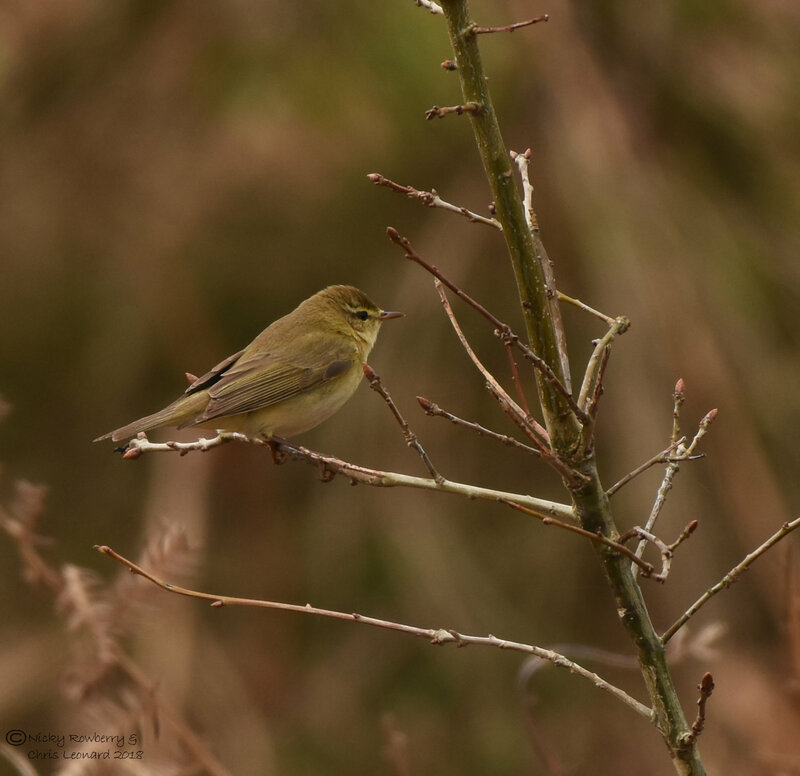 Last year we’d seen a small bird that was new to us and had identified it as either a Chiffchaff or a Willow Warbler. They are only distinguishable by their song and since we didn’t know to pay attention to this until it was too late, we couldn’t identify the bird. But this year we were definitely hearing Chiffchaffs all around us, so I’m reasonably confident that this one is a Chiffchaff (and probably the previous one was too). 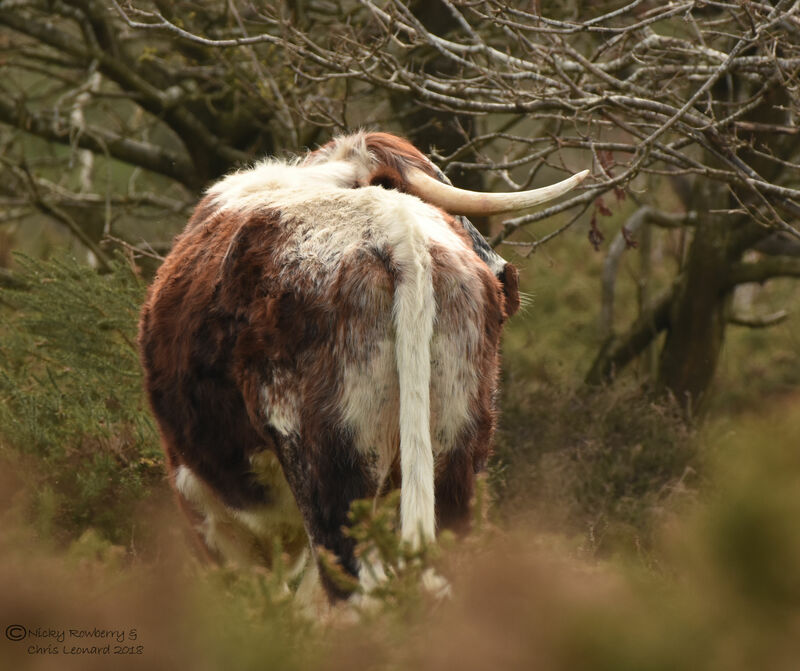 The most obvious animals on the common were these cows with their resplendent horns. No idea of the breed, but they were pretty impressive. They appeared to be free to roam, so were presumably used to maintain the status quo of the vegetation. So all in all we were very happy with our latest trip to Hartlebury. The pheromone lure worked a treat and the moths were every bit as stunning as we’d hoped. 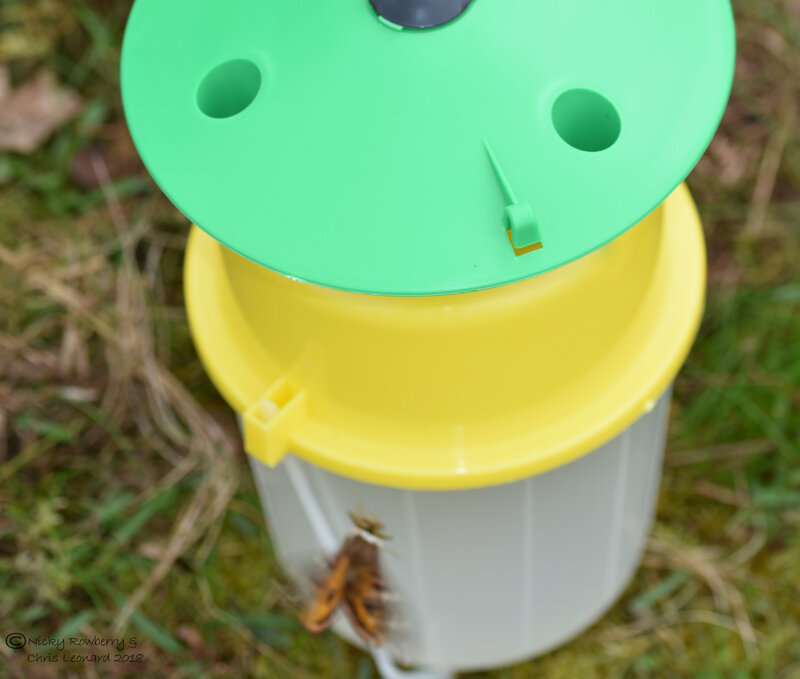 I’ve also bought the pheromone for the currant clearwing moth. These moths won’t come to regular moth traps, but like the emperors, the males are attracted to pheromones. So I’m hoping in the summer to try this out around our currant bushes on the allotment. Fingers crossed. Benjamin is fascinated with the Emperor Moth photos. When I enlarge them, he examines the entire photo picking out details on each one. He thinks the first photo of the underside looks like “a happy fuzzy face”. The word lure was new to him, he thought that they were being caught inside of it. I explained lure to him and he was glad the moths would not be hurt. 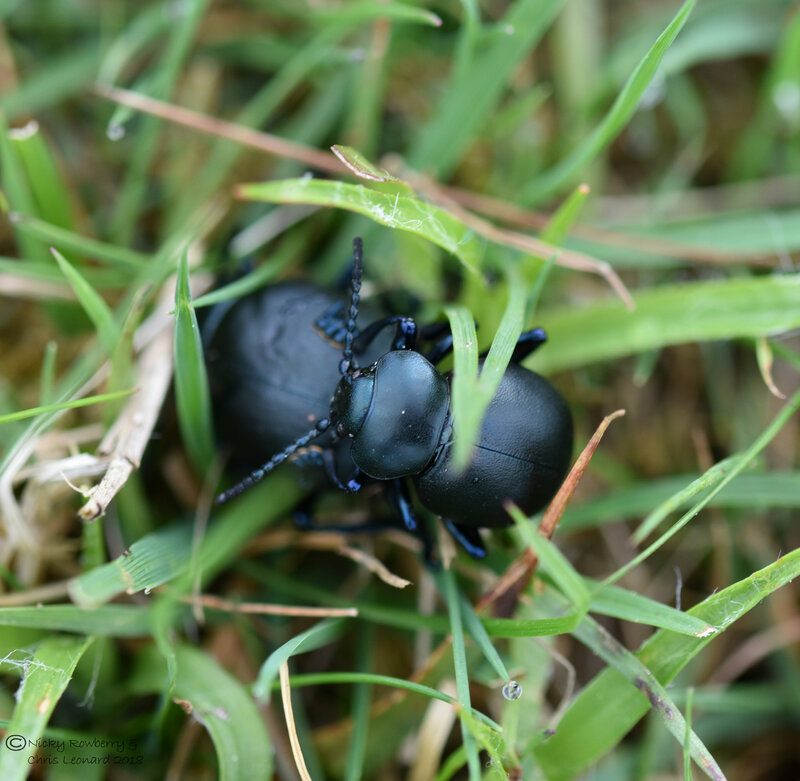 The bloody-nosed beetles are loved, but “that’s a silly name, his nose isn’t bloody”. The Chiffchaff is a new bird to me and both of us like that name. Thank-you x 2!! Lovely pictures again. Such an impressive moth. Those cattle will probably be English Longhorns. They’re an old breed suited to a free roaming life and they engineer the landscape through browsing and seed dispersal. 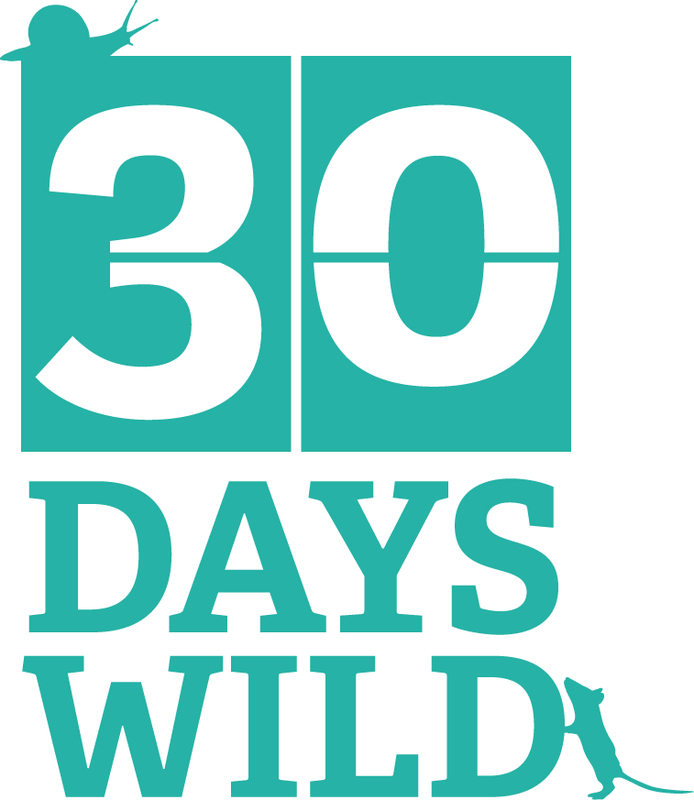 They use them at the Knepp Castle rewilding project apparently. Thanks for identifying the cattle. They certainly look like an old breed – rather magnificent! When I tell you that Benjamin was enthralled when I enlarged the photo of a bloody-nosed beetle sporting a bloody nose, I am not exaggerating at all! He asked question after question : “Is that from an ouchie?” “WOW, how does he do that?” “Why does he do that?” “Where does that come from?” and onto “Wait until Mommy sees this, Daddy will love it!” Benjamin also loved the Gorse Shieldbug. After the photo was enlarged, he was fascinated by the eyes. We enjoyed all the bird photos on this post too, especially the Jays. This was such a kind thing for you to do for Benjamin. Thank-you so much x 2!! What a fantastic opportunity to see these beautiful moths and the lure worked so fast! I may have a look at lures for myself and see what our tiny yarden can attract.